The iCruze is a 2 line LCD display that was made by Monster for an iPod stereo interface. It was a MONSTER FLOP!!! Several people including myself having been trying to use it for a general purpose LCD display with the Arduino or other micro-controllers. These pins exactly match the ICSP programming connector for the AVR processor. 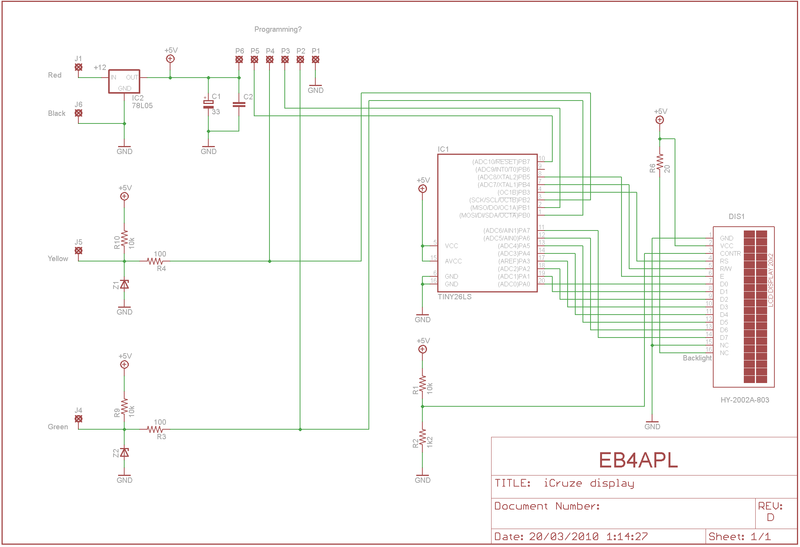 I have successfully connected an ATMEL AVR ICSP programmer to it and was able to read the chip. The Attiny26 has a USI port which is a very bad serial interface. 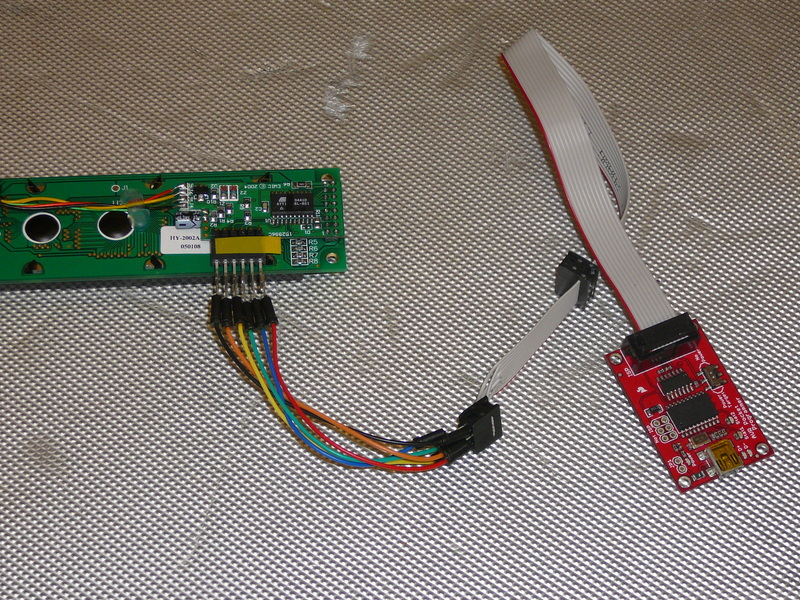 It HALF implements I2C (TWI), HALF implements the SPI interface and does about 1/4 of the work for a UART. There are some good ap notes on the Atmel site for using it AVR307 for the UART. But I could not get any of them to work reliably. I was able to get I2C working EXCEPT, I had to slow the bus down on the master for it to recognize it and then the code did not handle addressing and it would print anything sent to any I2C address. I wrote a simple software bit-banged receive which worked but not at full speed. I have implemented an interrupt driving bit-bang receive hard coded to 9600 baud. It seems to work perfectly with my testing so far. Refer to my source code for theory of operation. Shift In / Shift Out ( ^O=0x0f / ^N=0x0e) select alternate character set (Japanese and Spanish). The character sets are built into the display. I know this says the RAM is 70% full, but the rest of it is used at runtime so there is nothing left. I had to play with the size of the character buffer to get it run reliably. This guy in Spain started the process of hacking the iCruze, he figured out the schematic. I found some on ebay and got 20 of them REAL CHEAP. Since the controller board used an Atmel AVR chip and I have been doing a lot of Arduino and AVR programming I took it on as a challenge. The first step was to see what could be done with it as is. 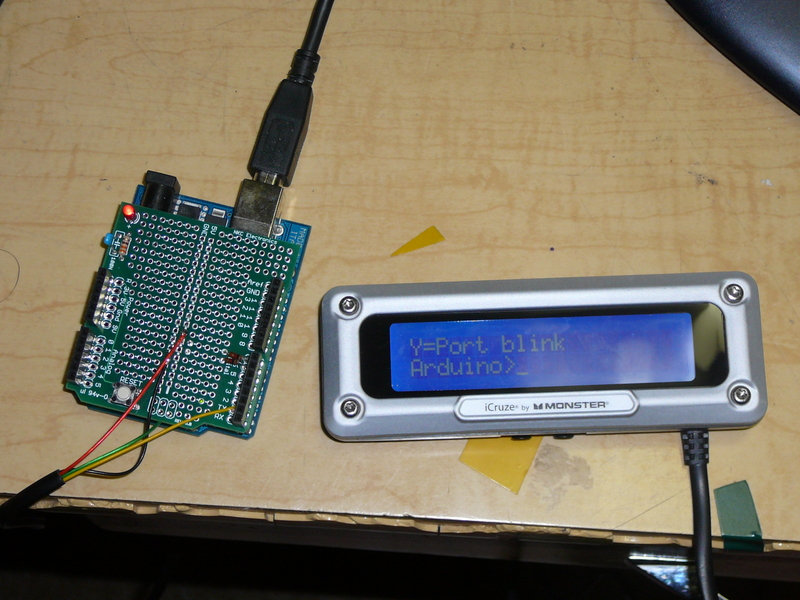 I tried connecting it via I2C and serial at many baud rates on both input pins, but the display never responded. Referring to the web page above, it probably is something weird since it sends a pulse out every 1.6 seconds. Next determine how to talk to the chip. There happened to be an unused connector on the board with 6 pins. I determined that those pins were indeed the ICSP programming pins. COOL!!! Next, fire up avrdude and see what we can figure out. Sure enough, I could read the program DOUBLE COOL!! I disassembled the program and started to figure out what it did. I decided that it would probably easier and quicker to start over from scratch. Write a program to try to control the LCD. Also, write a simple bit-bang serial output so we can do some debugging if the LCD doesn't work right away. I got the bit-banged serial output working right away but I really didn't need it because the LCD code worked almost first shot. I did major striping out of the library. I copied only the routines that I needed, got rid of the C++ and hard	coded all of the pin assignments. Remember, we have VERY LITTLE MEMORY. So get rid of everything that is not needed. Next is what should have been the easy part but turned out to be the hardest of all, get the communications working. I wanted to use I2C. The Attiny has a "USI" port, Universal Serial Interface, and I found it almost useless. Next I wrote a simple bit-bang receive. It worked fine at typing speed but lost sync at full speed when it got a carriage return. So I needed an interrupt driven routine to do bit-banging. The USI port has an 8 bit shift register that can be used for serial I/O but I found it more complicated than it needed to be and decided to just do it in software. The Attiny26 has 2 counter/timer ports so I took advantage of them. I wasn't using them for anything else. The clock timer is counter/timer 0 = 8000000 / 8 = 1 us per count. This is used for a timer standard to watch the time between bits. It then waits ONE FULL bit time (starting from 1/3 bit time after the start of the start bit) 8 times and puts the bit in at bit #7 (serial data is LSB first) and shifts the previous data. Getting this interrupt driven code to work reliably took 2 days. You can do 2 things with the above file. Option 1: If you have Eclipse, WinAVR or any other AVR development environment you can download the source and proceed as you normally would. Note, this will NOT work with Arduino IDE. 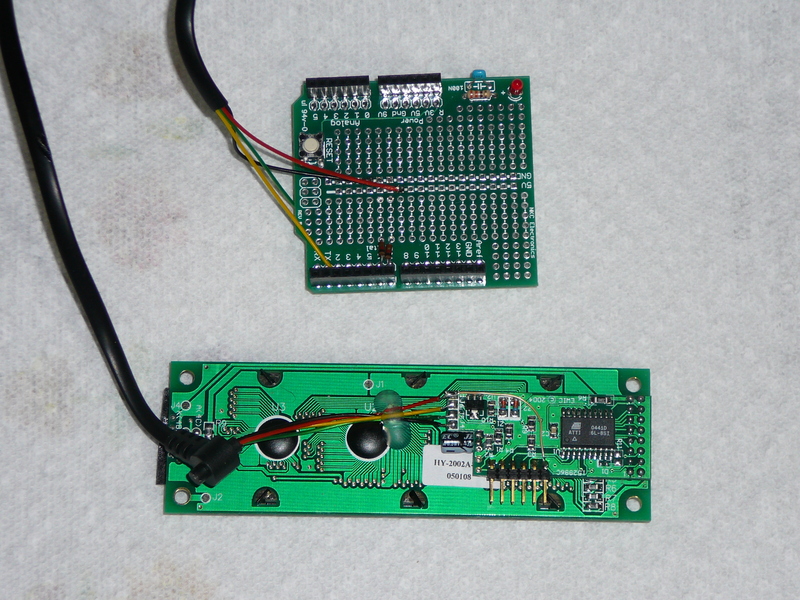 The size limitations do not allow a bootloader to be present so Arduino cannot be made to work. Option 2: If you have an ICSP programmer, you can program from the HEX file that is included in the above ZIP file. Below is how to use avrdude to program it. I use a "usbtiny" USB->ICSP programmer. Either way you will need a ICSP programmer of any type. avrdude: reading input file "icruzeLCD.hex"
POWER: The iCruze has a 7805 regulator so you can either drive it with 6-9 volts OR, do as I did and put in a jumper to bypass the regulator and then drive it with 5 volts from the Arduino. If you look closely you can see an orange wire connecting the red wire to pin 6 on the right angle connector. 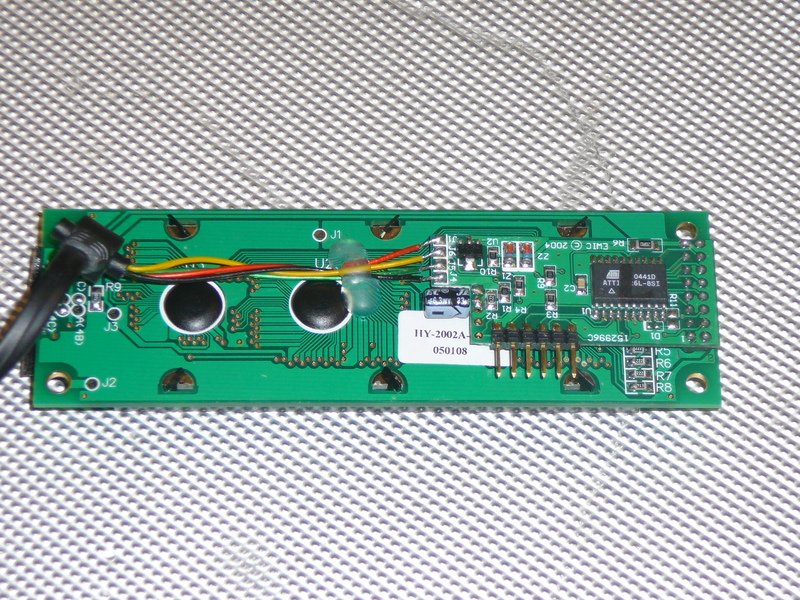 This bypasses the 7805 regulator. Whate else can be done with it? There is about 500 bytes of code space left but zero ram left. Someone could try to get I2C working with the Atmel ap notes. Continue trying to figure out what the original code did.